This may be called The Age of Hybrids. “Hybrid” is a current catchword. Seed packets proclaim, “New Hybrid Variety” and “Outstanding Hybrid Blend.” People drive hybrid cars. An epidemiological viewpoint is described as “a hybridized conceptualization” . Just do a web search for hybrid, hybridize, and hybridization. You’ll find many pages of results. A hybrid is what we also call a blend or crossbreed. According to Merriam-Webster , the word “hybrid” is a noun. “Hybrid” is also an adjective, identifying its object as being either a hybrid itself, or as being associated with a hybrid. A hybrid is a cross between two races or species of animals or plants. By extension, it is a blend of two or more cultures, schools of thought, religious beliefs, patterns of organization, etc. It is also a blend of two technologies in one product performing like functions. Examples of hybrids include mules (horse-donkey cross), various creole cultures and languages (such as Haitian in Haiti and Cajun in coastal Louisiana and Mississippi), and hybrid vehicles (using both hydrocarbon fuels and electric power). For several years, many mattresses have been promoted as being “hybrids.” So, what is a “hybrid mattress”? Where do we draw the line for what makes a mattress a “hybrid”? 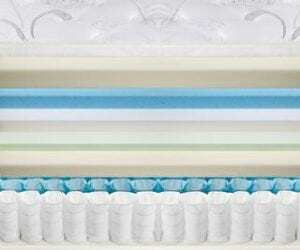 What are the advantages and disadvantages of a hybrid mattress? Online retailer US-Mattress says, “Hybrid mattresses combine two or more support systems,” usually memory foam or latex over an innerspring . Online and in-store retailer Mattress Firm says, “Hybrid mattresses blend support with cushioning” . The Better Sleep Council states, “A hybrid mattress combines a steel coil support system with one or more types of foam” . Sleep Like the Dead (SLTD) is more nuanced in its definition: “Innerspring mattresses with memory foam – especially those models [with] 1.5 inches or more of the material – may also be referred to as (memory foam) hybrid mattresses. They tend to have characteristics of both innerspring mattresses and memory foam mattresses” . Taking into consideration these varied descriptions of their type and roles, we can say that hybrid mattresses are blends of two or more mattress types. US-Mattress and Mattress Firm leave the door open for more kinds of hybrid mattresses than foam-innerspring. Also, SLTD includes foam-innerspring mattresses in the hybrid mattress category. When Is a Mattress a Hybrid? This seems to be a question of degree. While some manufacturers are quick to promote their mattresses as hybrids just because they have some foam on top of coils, there is a question of how much foam is required to qualify. SLTD acknowledged this question with its observation that 1.5” of memory foam may define the memory foam-innerspring hybrid. Reading further, they seem to draw the line there based on owners views. “Hybrid” mattresses with less than 1.5” of memory foam have an owner response more like that of innerspring mattress, while those with a greater memory foam thickness have results more like foam mattresses. While most hybrids are combinations of foam and innersprings, the definition can also include other combinations, such as memory foam with latex, and memory foam or latex with air or water. 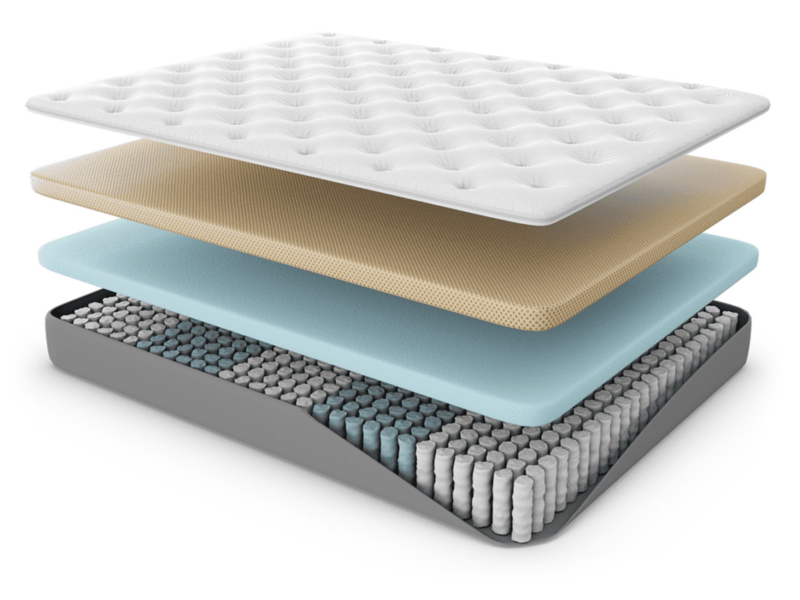 Boyd Sleep claims its iZone mattresses are multi-mode hybrids of water and air, latex and memory foam, and polyurethane foam support. The primary advantage of a hybrid mattress is, as many say, having “the best of both.” A traditional hybrid mattress combines the bouncy support of coils with the cushioning and conformity of foam. The kind of cushioning and conformity of memory foam and latex differ, but so far memory foam has been the more popular of the two. It is possible to have enough polyurethane foam above the springs to qualify it as a hybrid, but that is nowhere close to being common. 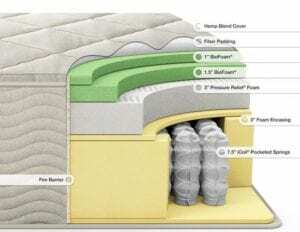 However, with the advent of latex-like foams (also called “engineered latex”), stand-ins for memory foam, and foam engineered to have both memory foam and latex properties (may I label them “memortex foam”), these are beginning to displace memory foam and latex in the top layers of hybrid mattresses. A fair evaluation of the actual performance of these newer materials relative to latex and memory foam awaits longer customer experiences. This advantage is missing with fiber-filled comfort layers, which serve only as padding atop the coils. In a hybrid, fiber usually serves as an insulator to keep the foam from tangling with the coils. The resilience, support, and durability of an innerspring depends on the kind of coils used. The most durable and supportable coil type is continuous coils. However, these are the type with the most pronounced motion transfer – the least movement of one sleeping partner is sensed by the other. For this to really work in a hybrid mattress, it needs a thicker foam layer than other foam-coil hybrids. Although continuous coils are less costly than other coils types – especially pocket coils – this cost saving is countered by the expense of additional foam. On the other hand, encased pocket coils are the most conformable with the least motion transfer. However, since they are not tied to each other, therefore not supporting each other, they are more liable to coil failure or displacement. This is not as great a problem as it could be, since the pockets are attached to each other, increasing the stability of the coil array as a whole. The primary disadvantage of a foam-innerspring hybrid mattress is sagging. Foam layers on an innerspring are more likely to lose support and compact under the heavier parts of a sleeper’s body than when they are on a firm foam support core. This is because, except for continuous coils, the innerspring’s surface has greater deflection (it flexes more) than a slab of extra firm foam, the extra flexing breaks down the memory foam’s cells faster. As mentioned above, there are really several kinds or varieties of hybrid mattresses. The most common hybrid is foam-innerspring. The foam is usually either memory foam or latex, but replacements for these common forms are being used more (see “Advantages” above). Though performance is cited as the advantage, the real reason for the switch may be cost. These are fluid support mattresses with comfort sections substantial enough to qualify them as hybrids. There are two types of fluid support, liquid and air. The advantage of these hybrids is combining the advantages of fluid support with the comfort of memory foam or latex. Liquid support mattresses are commonly known as waterbeds, because water is the original and the most used liquid. However, some waterbed manufacturers are offering other liquids in the support modules, usually tube-shaped fluid chambers in soft-sided waterbeds. Air support mattresses (airbeds) have been used in bedrooms since Comfortaire introduced the first line of adjustable airbeds for regular bedroom use. The five most highly rated adjustable airbed manufacturers on Sleep Like the Dead – Air-Pedic, Boyd Sleep, Innomax, Personal Comfort, and Sleep Number – have models which qualify as airbed hybrids. This was the formulation Casper Sleep used in the original Casper Mattress. It is also the combination used in the Fibro-Pedic and Soft-Pedic by Selectabed. The Casper had a top layer of latex over a second layer of memory foam, while the two Selectabed models has the memory foam on top. The relative thickness of the two materials qualifies all three as hybrids. Casper Sleep put the latex on top to keep the mattress cooler, while Dr. Swartzburg, a chiropractor and the developer of the Fibro-Pedic, Soft-Pedic, as well as the Tri-Pedic, wanted the conformity of the memory foam on top, while the latex provided extra support. There are other latex-memory foam hybrids on the market. These can best be described as hybrids on two levels. First, they have an innerspring, air, or water support core and a foam comfort section. Second, they have equal or nearly equal diversity within the comfort section. Boyd Sleep makes the iZone Bed, which combines water, air and memory foam. InnoMax makes two Convert-A-Bed brands, Comfort Craft® and Luxury Support®. In these brands, the comfort section is the same for each “model.” What changes is the support core, which can be coils, latex, “memory cells” (support-grade memory foam), fluid (water), or air. Luxury Support has both memory foam and latex in the support section. Selectabed has a mattress they call a “hybrid” – the Flex-Tech. 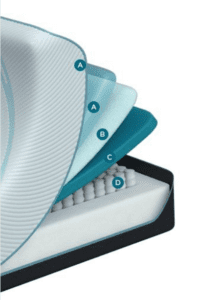 This is an all-foam mattress with the comfort layers in the four models ranging from 2” to 4.5” in height, the pillow top panel either 1.5” or 2.5” thick, and the support core from 3.5” to 6.5” high, depending on the model. The comfort layer plus the pillow top ranges from 25% to 54% of the total height of the mattress. Why are these mattresses called hybrid? Because of the nature of the Resili–Flex™ foam in the support core. Selectabed calls the support core a “Foam-Spring Support Layer.” Why? This foam is engineered to have the resiliency of an innerspring. However, the support is smoother than an array of individual coils. So this is a different kind of hybrid. The development of microcoils has introduced another kind of hybrid. 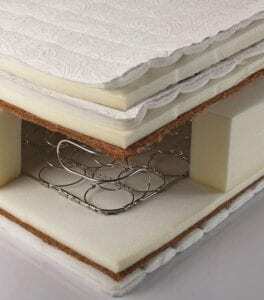 Several mattresses now have comfort layers of microcoils and minicoils. These layers create foam-coil hybrid comfort sections, A 1.5” to 3” microcoil layer reduces the overall weight of the mattress, increases conformity, and makes the mattress cooler. Hybrid mattresses are here to stay. From thicker foam layers over innersprings, this mattress category has become diverse, and its diversity is likely to increase. As another sign that hybrids have come of age, TEMPUR-Pedic, the original memory foam mattress company, introduced its TEMPUR-Flex Collection of hybrid mattresses in 2016, and two of its new collections, TEMPUR-Adapt and TEMPUR-ProAdapt, each have hybrid models.